If you have ever faced this problem (haven’t we all? ), you likely want to understand the elements of an email marketing subject line that compel someone to open an email. So I’ve rounded up some gems of wisdom from the email marketing experts — all based on research — that you can come back to again and again when writing those pesky subject lines that are oh-so important in spurring recipients to open your emails. Ask a question. This technique works because as long as a question is relevant, it creates the itch for an answer. Here are some ideas for the type of questions you should ask (HINT: Not ones with easy answers). Be relevant. The need for relevance is what drives today’s marketers to segment their emails. 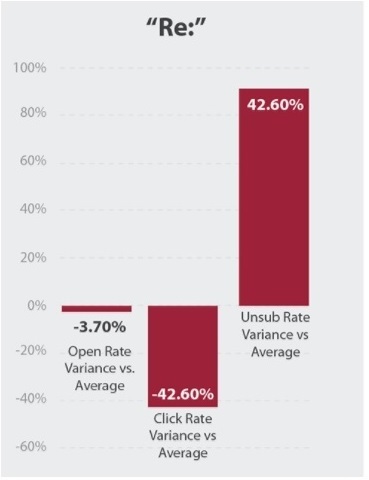 Without segmentation, not only will your open rates decline, but your unsubscribe rates will escalate. Keep it short. The omnipresent guidance is to keep your subject lines below 50 characters. This infographic breaks it down further, showing that the highest click rates go to emails with subject lines of 4-15 characters. Why waste words when, according to Dorothy in the movie Jerry Maguire, “You had me at ‘hello’”? Note, however, that AlchemyWorx discovered a surprising twist to this oft cited advice of brevity. 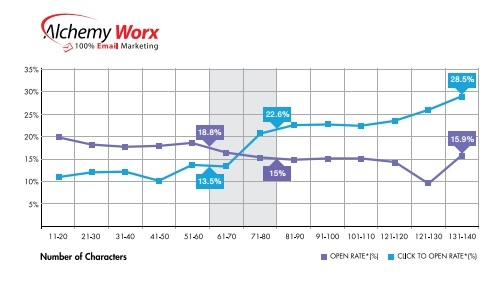 If someone opens an email with a lengthy subject line, they are more likely to click on a link. So pay attention to both metrics — opens and click-throughs. Based on the chart below, you might want to stay out of the 61 to 80 character zone. That’s a no man’s land where neither open-rates nor clicks are optimized. This article from Unfunnel is based on knowledge they gained from sending 1.25 million emails over the course of a year. Social proof — don’t you feel better if unbiased reviewers like the product or service? Find out the theory behind what subject lines that work. Also, discover the 112 best subject lines…so far. Use these as your cheat sheet when creating your next email subject line. It never hurts to “borrow” from the best. And while you’re at it, here’s another post chockful of attention-getting subject lines. If you’ve been doing email marketing for a while, you know the importance of A/B testing. In this article, William Wickey talks about the art and science of testing cold emails and demonstrates the results you can achieve through this process. You’ll gain insights on the pros and cons of each subject line tested. ContactMonkey analyzed 30 million emails to determine which sales emails are most likely to be opened. After reading the results, you may be tempted to stop fretting about your subject lines. That’s because the number one best performer was “Re”. Don’t go overboard though. There’s a catch. Another report from Adestra shows the second time you use “Re” in a subject line, subscribers are likely to bail out on you — click rates plummet and unsubscribes skyrocket. Adestra’s study, based on more than 3 billion emails, analyzed more than 300 keywords across a spectrum of industries, including B2B, professional services and financial. It reviewed the most common words as well as two-word phrases. Surprisingly, the word that works best in the business world to spur open rates is … drumroll, please … NEWS! So if you have news, announce it. Other top performers that also fall in the newsworthy category are newsletter, latest, research and update. Check it out. So now you have research based advice at your fingertips. What’s next? Try out some subject lines and optimize them through A/B testing. If you’re not sure of your best options for testing, you can try a couple out in this handy subject line tester. It tells you how good your subject line is and how to make it better. 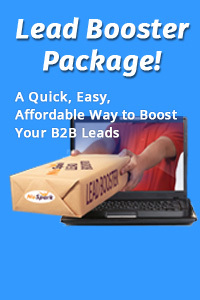 With all these tips and tools you’ll be able to rock your email open rates and increase the success of your campaigns. Enjoy!